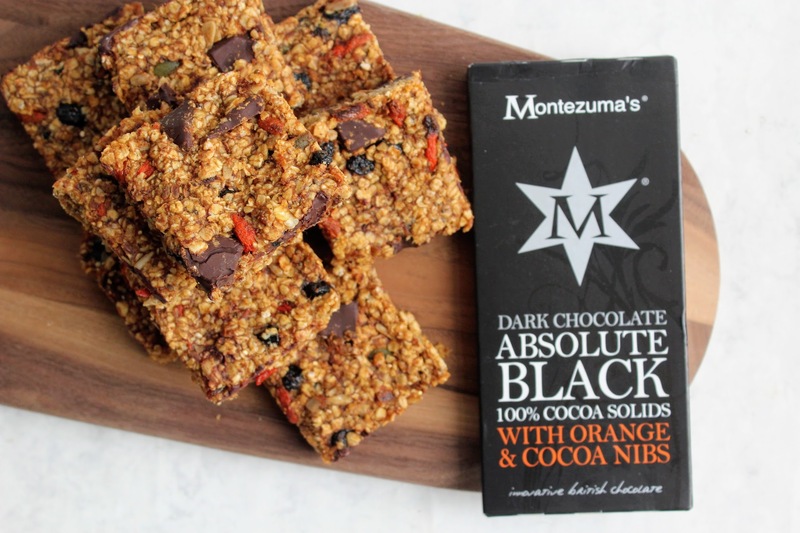 It was a pleasure to create a healthy snack recipe working with Montezuma’s, a family business producing ‘innovative British chocolate’ while ensuring they do a good job with equity and integrity. 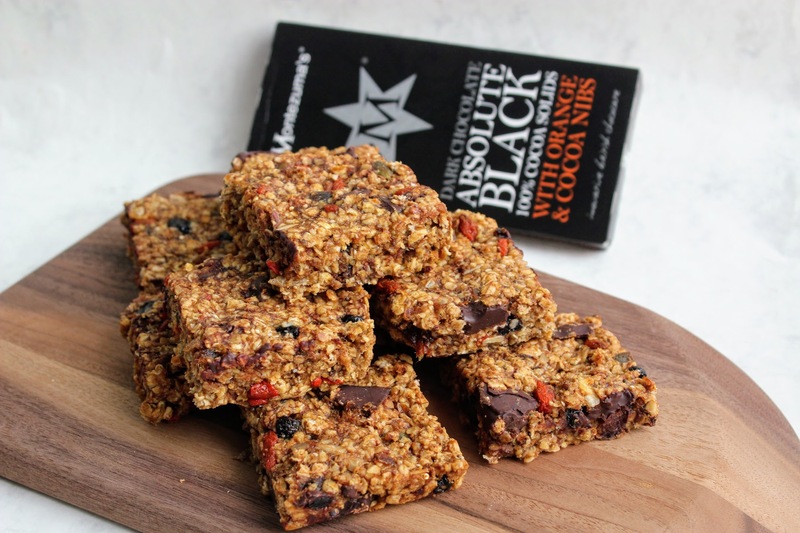 I was sent some of their incredible Absolute Black 100% cocoa solids bars to play around with, which just happen to contain no dairy or sugar due to the cocoa content. 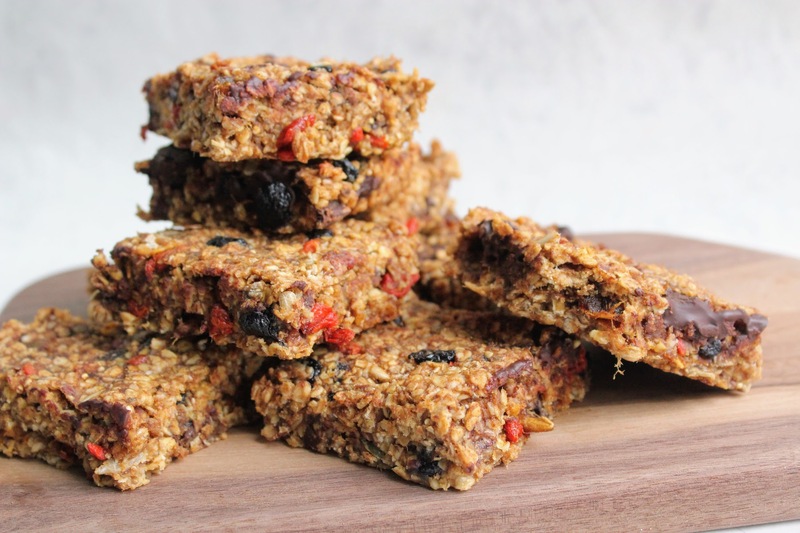 Rich and intense, I thought the orange & cocoa nib variety would pair well with oats, dried fruit, nuts and seeds to create these easy, delicious and natural energy packed snack bars – ideal at any time of day, whether as a breakfast on the go, for those mid-morning or afternoon munchies or before/after the gym. 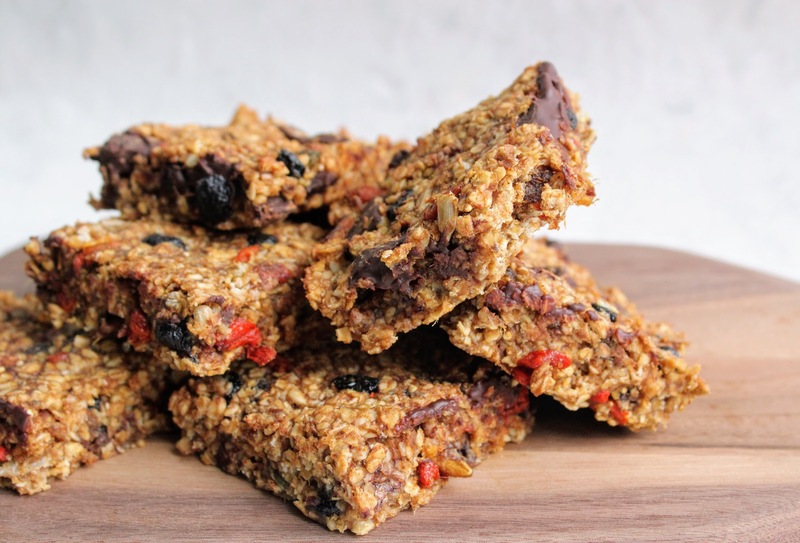 With chunks of chocolate for that sweet tooth, who says snacking has to be boring and tasteless?! 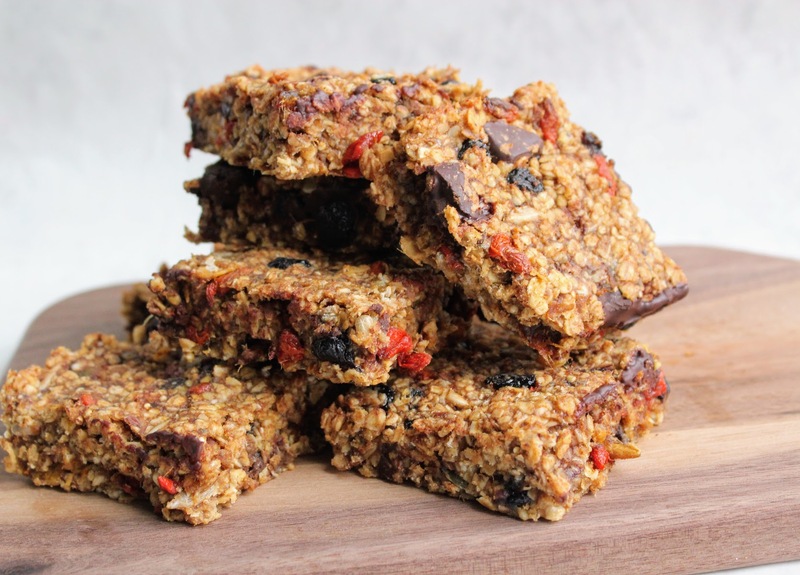 Mix together the oats, seeds, goji berries, dried blueberries, cinnamon and orange zest in a large bowl. 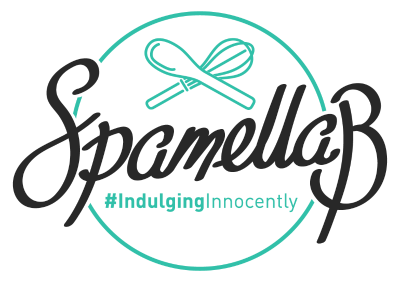 Place the dates in a pan with the water, bring to the boil then simmer for 10 minutes until softened and quite mushy. Add the maple syrup and almond butter towards the end to allow the sticky mixture to combine. Allow to cool a little. 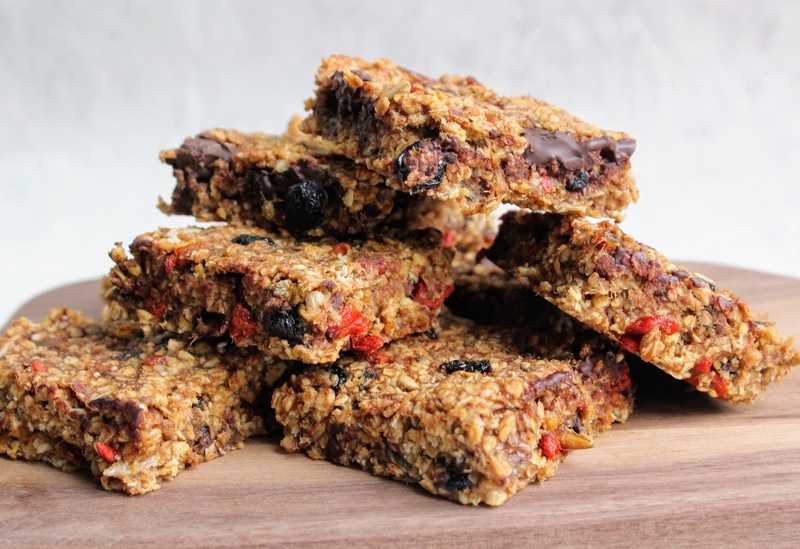 Pour the cooled mixture into the oats and stir well to coat everything in the sticky mixture, then fold in the chocolate. Tip into your prepared dish and use the back of a spoon to push, making sure it spreads out evenly. Bake for 15-20 minutes until golden brown. Leave to cool for 10 minutes, then cut into 9-12 bars. Cool completely before removing from the tin – then enjoy!